Klaus Wälde has been professor of macroeconomics at JGU since 2009. Prior to his appointment in Mainz, he held professorships in Dresden, Würzburg and Glasgow. He also worked as advisor for the European Commission and the World Bank. Wälde is an expert on economic theory, Business cycles and international trade. His recent work also focuses on unemployment and inequality. To strengthen dialogue with neighboring disciplines such as psychology and philosophy of mind, he initiated interdisciplinary research in the Center for Emotional Economics. His work is frequently published in leading international journals, such as the Journal of Economic Theory, Economic Journal or International Economic Review. 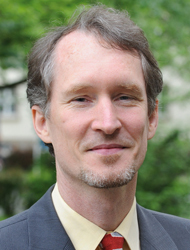 As a GRC fellow, Klaus Wälde held a research professorship from 2009 to 2014. Press release "Welfare state reform: Economist Klaus Wälde launches discussion on compulsory kindergarten attendance"
Press release "Hartz IV reform did not reduce unemployment in Germany"